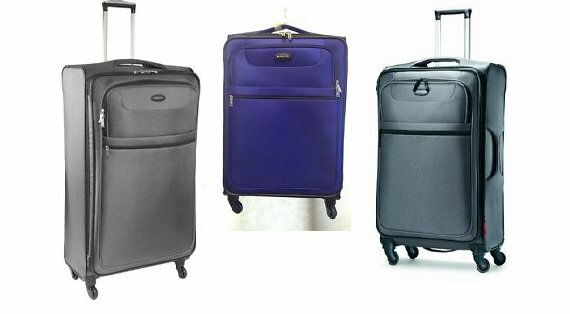 This is the summary of consumer reviews for Samsonite Lift Spinner 25 Inch Expandable Wheeled Luggage. The BoolPool rating for this product is Excellent, with 4.60 stars, and the price range is $106.22-$228.08. The Samsonite Lift Spinner 25 Inch Expandable Wheeled Luggage is designed to deliver extreme lightness combined with amazing strength during travel. 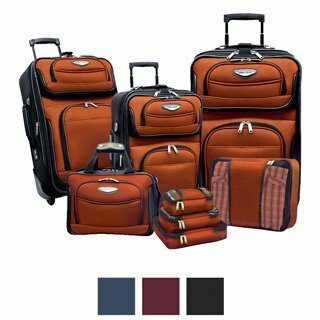 The luggage is made of rugged Poly/Nylon blend fabric, the outer shell is an abrasion and tear resistant tri-core material making it dirt and water resistant. The Samsonite luggage features four multi-directional spinner wheels, which allow a 360 degree upright rolling to avoid weight on the arms. This durable spinner wheel is protected from harm by a smart design incorporating a full corner protection, making it easy to roll on any surface. The telescoping handle expands (up to 25 inches) and retracts smoothly. It also integrates a top and side carry handles for easy carrying and convenience. This luggage is semi-framed which makes it ultra-light and gives the flexibility to pack those extra items we wish in this weight conscious world of travel. The wheels, handles, zippers are all designed to store flush and not protrude out which enhances the durability and life span on this luggage. The luggage also features two exterior front pockets, one large interior pocket on the door, two large winged compression straps to keep the garments more secured and organized. This luggage expands 2 1/2 inches for some extra packing and the rubberized corner guards keeps it safe from scratches to ensure longevity. However, the luggage cannot stand upright when fully packed and expanded, and in some cases handles did not work very well. Some users feel the quality of this bag is very disappointing and not on par with the brand. 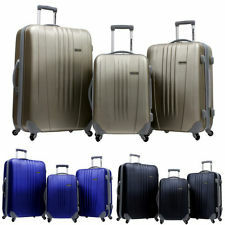 In addition, the users who ordered purple color luggage are disappointed, as it was more on the bluish side when received. 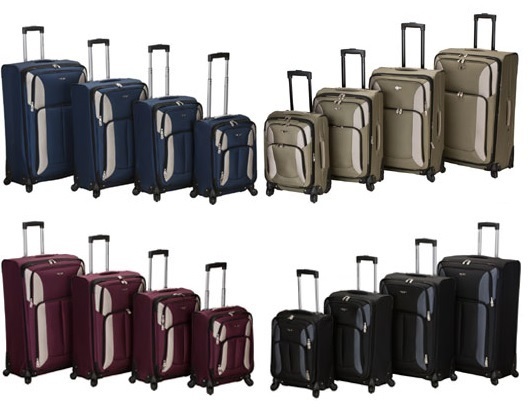 Overall, the Samsonite Lift Spinner 25 Inch Expandable Wheeled Luggage is highly recommended by users for its lightweight, spacious capacity, effortless mobility, excellent quality features and affordable price. It is perfect size for constant travelers facing weight limit, and offers a hassle free travelling experience. It suits her perfectly for the future trips she's planning to take. I bought this for a trip starting in a week, so I haven't actually used it yet. bought this item after reading reviews and it's great. Excellent quality, color compatible with any wardrobe and near effortless mobility. perferct for trips where the dainty 20inch carryon is just not enough. 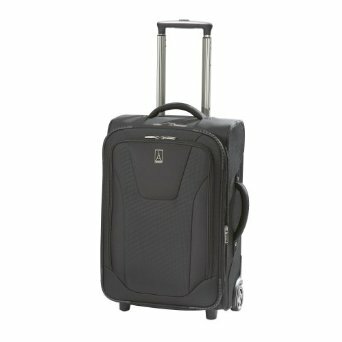 Roomy and easy to negotiate, this Samsonite Lift Spinner takes some of the hassle out of traveling for more than a weekend trip. Nice luggage from ten to fifteen days trip, it's large and high capacity to load your things. I'm so happy I bought this Samsonite Spinner Luggage. The size is perfect for air travel--- large enough that you can pack a lot of stuff, but not so big that a full suitcase goes over the checked baggage weight limit. I highly recommend this luggage for any traveler facing a weight limit. It's light weight so I can lift it more easily or pack more and not go over the weight limit. These are very light weight, sturdy and spacious. we love the weight, it adds no weight to your items. We ordered this lightweight luggage to take to Europe where they've very strict weight limits. It's very durable and because of the weight, more items can be packed and still keep the weight under the limit for the airplne requirements. Its big big enough to hold 3 week clothes, its very very very lightweight!! The wheels work well, much much better than my old non-spinner luggage with fixed wheels. thats valuable when you travel a lot!. The bag is very spacious and looks very nice!. I love this bag, it's so lightweight and looks fantastic. MY only issue was that when fully packed and expanded, the bag wouldn't stand up alone and kept falling forward! LL Bean also replaced the bag portion of my step daughters large duffel bag that got damaged after many years of use. The quality of this bag was extremely disappointing. The bag was really great for our recent 2.5 week trip. The bag itself is very lightweight and EASY to spot the beautiful color on the baggage conveyor belt!! I've the smaller version of this bag as well. Easy to handle, love the spinner concept and its light and the price was right. 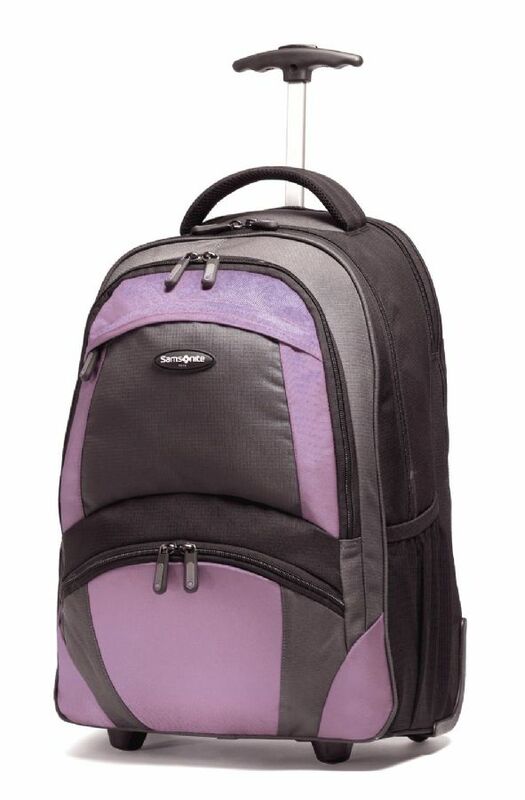 Very light and easy to maneuver-this suitcase holds an incredible amount of clothes!. Lightweight, super easy to maneuver and holds a ton, I can pack for a whole week, still have room leftover and it's still light enough for me to pick up. This suitcase everything I hoped it'd be -mobile, light, easy to use and attractive. It's very light, and I love the color. We were looking for a light weight case and this was perfect. Its really LIGHT and its a really good price if you buy on the deal. It was also very easy to maneuver. NICE AND LIGHT SO CAN PACK ALMOST 50# WITHOUT WORRY ABOUT OVER-WEIGHT LUGGAGE YET IS SUBSTANTIAL AND EXPECT TO GET MUCH LONG USE OF IT. The spinner wheels make moving the bag easy. The wheels roll smoothly on airport surfaces, sidewalks, carpet. I love the wheels as they make manuevering it easy. Very easy to wheel around in any direction, roomy, wheels turn smoothly, very happy with this product, would consider purchasing more in future. I purchased this piece of luggage after my ancient two-wheeler luggage's wheel disintegrated while rolling through the airport. Wheeling this bag with a smaller one on top was very easy. Extremly light weight, good quality,easy to handle,love the color "Charcoal" and the wheels.It's very easy to move around in and out of the airport and hotels. It's ultra light and very easy to carry, specially for the 4 wheels. It was extremely easy to roll it through the airport. The wheels are that good. Zippers work well and handle worked well and comfortable. the spinners make it so easy to handle. The handle on this Samsonite is perfect. I love spinning wheels on luggage; it makes it so much easier to handle. Excellent piece of luggage, lightweight and spin very easy. the only problem we faced was that the handle, which came in perfect conditions, didn't work well after the flight. 2 SIDES HANDLE ARE CONVINENCE. The luggage has a handle on the bottom end, too (3 handles in total: top, right, and bottom), so if you're lifting the luggage to face up you can hold the luggage with both hands, which leads to less wear and tear on the top handle. Side handles for lifting also nice. The handle broke during a Delta flight. Beautiful suitcase, GREAT Amazon price, bought it for $116.00. I bought it because of the spinner wheels and I really enjoy that feature. 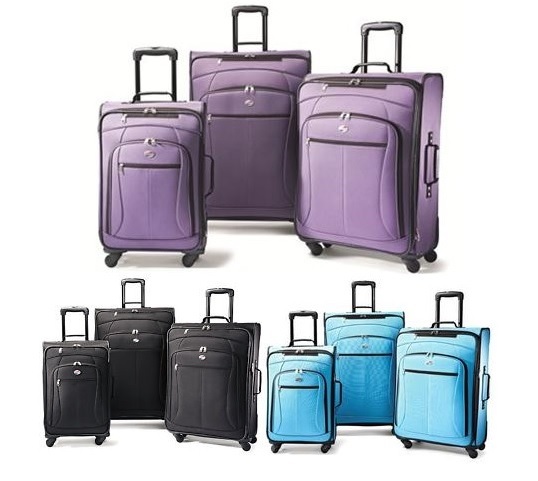 I priced 25" spinner suitcases at Samsonite outlet as well as department stores and found that Amazon had the best price and being a Prime member, shipping was free. The suitcase is really light and of great quality. 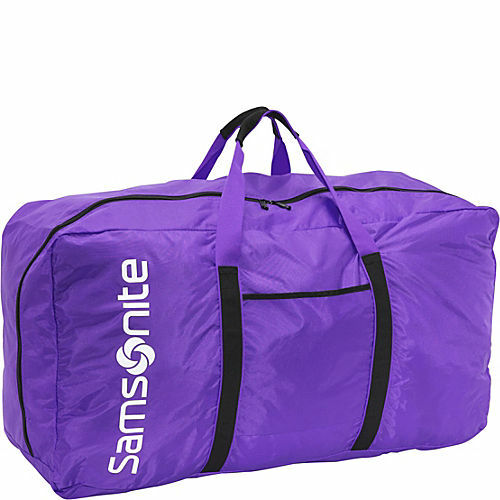 Ladies, if you really like your suitcase to be purple and looks like the photo shown here on Amazon, you'll feel misled when you receive your suitcase because it's really BLUE. I bought it because I love the color purple. Good solid suitcase, looks like it'll hold up well. I was kind of disappointed when I received a blue instead of purple suitcase and I called Samsonite to clarify if they really have a purple color in this series of suitcases, the customer representative was nice and honest enough to tell me that they've a purplish blue and on their website, most of the photos shown blue color in this suitcase and only a few really show the purple color under certain lighting. 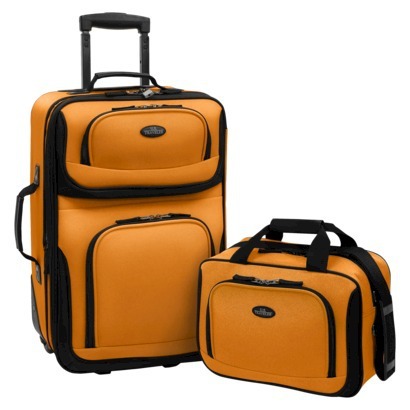 Later, I found this luggage on Amazon.com and bought two 25 inch ones and saved $100 total from the outlet price.